I’ve written a version of this post every year since 2012. I lived with a Southern Baptist for over 23 years, and although we committed early on to raising our children Jewish, Christmas was a very big deal. We spent it in Texas with her family every year except when our two December babies were born, in 1994 and 2000. As you can imagine, Rebecca Lord was no stereotypical southern girl. She was opinionated, argumentative, and fearless, and she was strongly committed to her left wing beliefs. For her, religion was action and boy did she act. Since her passing in July, 2012, I’ve become enormously committed to carrying forward her beliefs, which is fine because they dovetailed pretty well with mine. Not that you could always tell – we loved to fight and to argue, even when we agreed. It was sport, pure and simple, over things we cared deeply about and sometimes about stupid stuff like which was the fastest way to get from point A to point B. That first Christmas in 2012, I couldn’t figure out what to write about. I knew I had something to say but wasn’t sure how to say it. That morning, listening to my iPod, I heard a song that crystallized what I needed to say about her, her background and her relationship to Christmas. 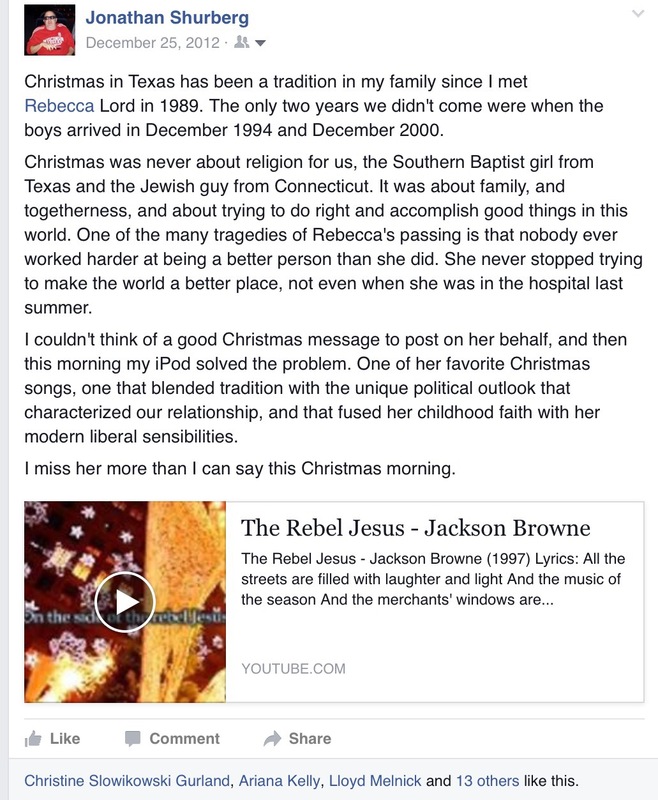 It was “The Rebel Jesus” by Jackson Browne, and it’s remained the center of each Christmas post I’ve written since. That 2012 post is here, and I beg your indulgence on this late Christmas Eve. As the world continues to sink more and more into chaos and despair and hate, we need more rebels if we’re ever going to begin to make progress on the burning issues we face. I’m distressed tonight having just watched “The Big Short” about the real story behind the 2008 Great Recession. But at the same time, inspired by the determination and grit and brilliance and kindness of the woman I was blessed to be with for so many years, I am equally determined not to give up. Merry Christmas to everyone reading this. I hope this season brings you joy and peace. I can’t tell you how much it’s meant to me to have so many people tell me how much they enjoy reading what I write. I know this – this blog is one of the most rewarding things I’ve ever done, and I’m looking forward to continuing with it into a new year. And here’s Jackson Browne to serenade you into a tropical and balmy Christmas morning here in Maryland. Current temperature at 11:33 is 64 degrees. Prince George’s Delegate Jim Proctor, vice chair of the House Appropriations Committee, died earlier today at the age of 79. Josh Kurtz was first with the news, and the Sun has now also reported the sad news as well. He was a well-liked and respected legislator for many years. My condolences to his friends, family and colleagues. In more mundane news, the Prince George’s County Democratic Central Committee now has two vacancies to fill. In case you missed it, Maryland’s own Batman (complete with a Lamborghini Batmobile) was killed yesterday after the Batmobile broke down near Hagerstown. Lenny Robinson was 51. A tragic loss. Robinson went viral back in 2012, when he was pulled over in full costume driving the Batmobile. RIP. I was looking at a bit of a problem today. It’s a big day in politics land, with the FEC deadline and several candidates not having shared their number yet. So there’ll be some good stuff to report, maybe even a nice chart comparing fundraising and cash on hand (COH) numbers. But today is also the third anniversary of my late wife Rebecca Lord’s death on July 15, 2012. So you can imagine I’d want to recognize that fact – maybe with no posting at all – but the reality is there’s some important news to report. And that’s my job. What to do? I think I’ve worked it out. Rebecca, as anyone who knew her would attest, was an eminently practical woman, and I hope she’d appreciate my solution. I’m going to write today but only about two things: fundraising numbers and Rebecca Lord. I’m going to do one post later on today in her memory and honor. If you don’t know me and you didn’t know her, it’ll give you some insight. But it’s going to be much more for me than for anyone else. For now, though, this blog is officially in mourning for the rest of July 15. 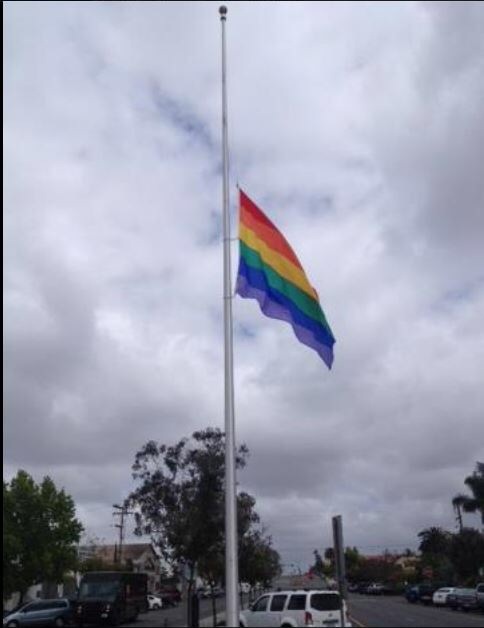 To mark the occasion, and the great LGBT ally and advocate that Rebecca Lord was, the Pride flag will fly at half staff permanently, right here in this post. She was and always will be the best person I’ve ever known.